Start by upcycling some old dishes from the thrift shop. Crush them into bits with a hammer when they're between towels. 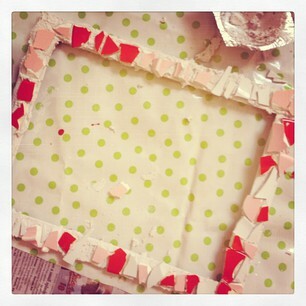 Glue them to a simple frame using tile adhesive from the hardware store. 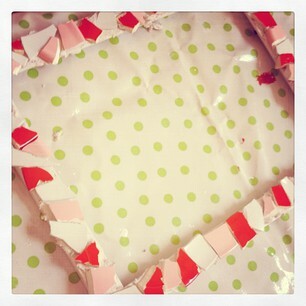 Keep gluing until you've fit all the pieces together like a puzzle. If you like a smooth look, apply some grout (from the hardware store) between the tiles with your fingers. Let dry and polish the tiles so they are clean and shiny again. Fill with a photo of your mom and give it to her with a big kiss for Mother's Day. 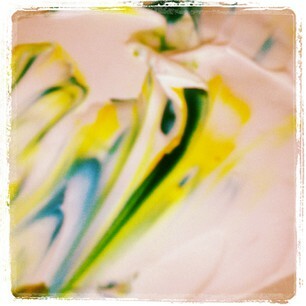 One of the easiest and cleanest ways to create groovy swirls on paper is to use shaving cream. It's clean, smells good, and washes right up! 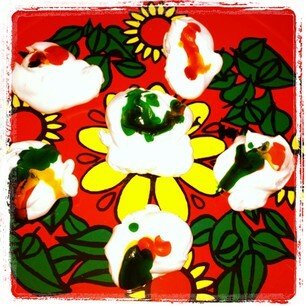 Find a tray and make little shave cream piles. Drip a little watercolor paint or food color on it. Use a toothpick, fork, chopstick or your finger to swirl it around. 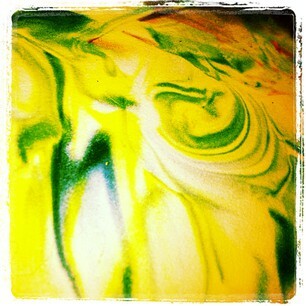 Swirl some more until it looks awesome to you. Press a piece of cardstock onto the colored shave cream. Wipe off. An incredible design will remain. Spring has come to Boulder and we're set up for painting and art in the garden of my cottage! My wee friends are joining me here for some Spring garden art on Sunday mornings. 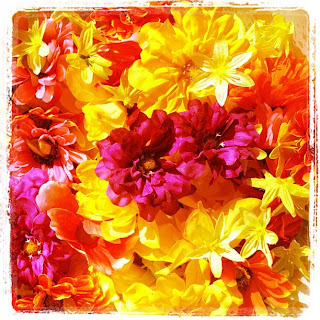 We're planning mosaic tile stepping stones, handstitched dream pillows, decoupage flower paintings, and seashell herb gardens. I'll post all of our projects here, in case you'd like to try some in your garden too! 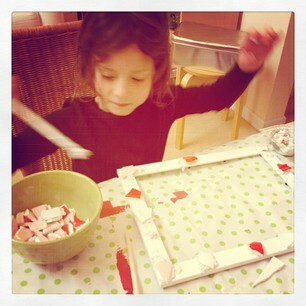 We're starting with giant frame wooden mirrors from Ikea. 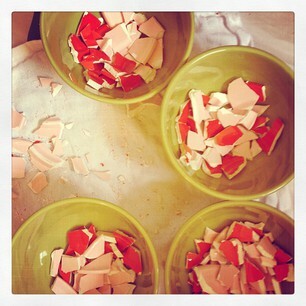 After we paint them, we'll cover them with glass mosaic tiles or even colorful flowers. Stay tuned to see how they turn out. Clementine Art at the easels. Easel = large sheet of plywood + a gorilla clip. Viola! 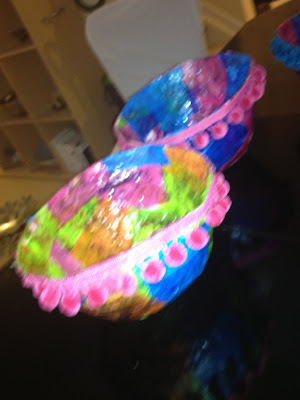 we made some big old bowls from papier-mache, tissue, mod-podge and pom-pom trim. the girls loved them and even asked if they could eat their cereal out of them! (the answer, sadly, is no). 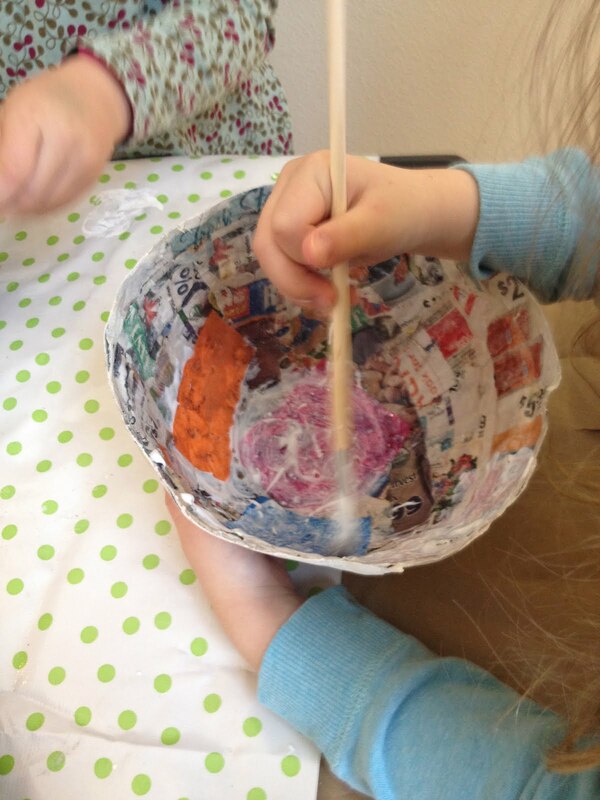 turn a large bowl upside-down and cover it with saran wrap. spray liberally with cooking spray. cut strips of newspaper and mix up your papier-mache paste with flour, water and white glue. *it should be the consistency of pancake batter. cover the bowl 2x with many strips of papier-mache. then cut up some tissue paper. 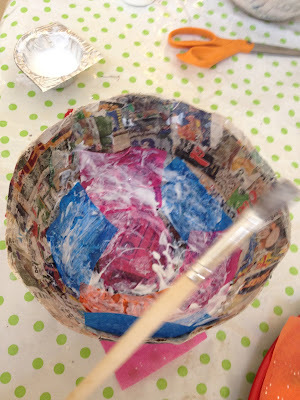 brush both the inside and the outside of your bowl with mod-podge (a little at a time), and cover with tissue. the add ANOTHER coat of mod-podge on top for a shiny coating. after that layer dried we hot glued on some pom pom trim. they're gorgeous! Refined white sugar has been linked to myriad health issues including cancer, obesity and premature aging, among others. 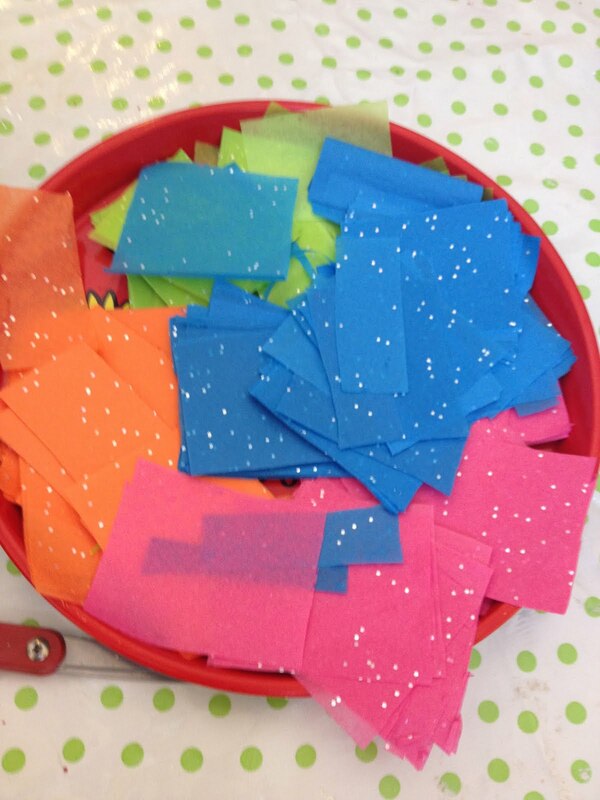 As a lover of baked goods and sweet treats, I set out to teach children how to enjoy baking and the cozy reminders of childhood (chocolate chip cookies?) without overloading on white sugar. Caramel-y rich, sticky, and actually, less sweet! Can be substituted for any other liquid sweetener in equal measure. Stevia in the Raw (cup for cup). Normally, Stevia is such a powerfully concentrated sugar replacement, you'd only use a fraction of the sugar equivalent, which can be confusing in recipes. 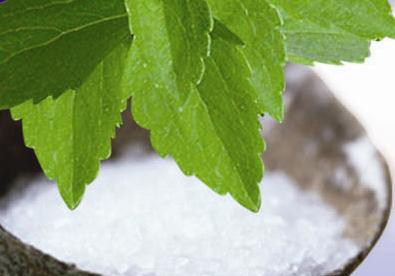 Stevia in the Raw is measured cup for cup in place of white sugar. Pretty great. 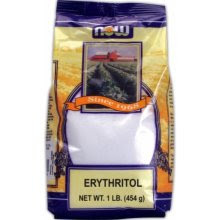 Erythritol is a plant based sweetener that can be used as a sugar substitute in most sugar-free recipes. Erythritol is present in foods such as pears, melons, grapes and mushrooms. Erythritol is 100% pure and derived from corn. Abe's Market Live wants to know more about Clementine. Learn the story from Clementine founder Diana. What Your Child Already Knows. Our complex world is struggling under the weight of disease, war, Global Warming, poverty, hunger, and vanishing resources. We expect the world’s population of approximately 6 billion to become 12 billion by 2054 if the current rate of growth continues. A great deal of creativity will be required to respond to these challenges. We need citizens with big ideas here. The potential consequences of a decline in American creativity are far-reaching. According to Newsweek, the necessity of human ingenuity is undisputed. Divorced from the formative and developmental experience of creativity as a part of everyday life, children are losing the ability to create. US creativity scores have been falling since 1990, and children from kindergarten through sixth grade exhibit the most serious decline. No Child Left Behind (NCLB) legislation, implemented in 2001, was designed as an education reform movement dependent on high standards, and measurable goals in core curriculum areas. Even though the arts are a designated subject of this core curriculum, it has been reported that since 2007, almost 71% of schools have reduced instruction time in subjects such as history, arts, language, and music due to NCLB’s greater emphasis on reading and math. Creativity has slipped as a priority in our homes as well. Television, technology, and video games have replaced engagement in the creative process. On average, children spend as much as 7 hours, 38 minutes a day in front of a screen, according to a survey by the Kaiser Family Foundation last year. At Clementine Studio, the evidence was clear. 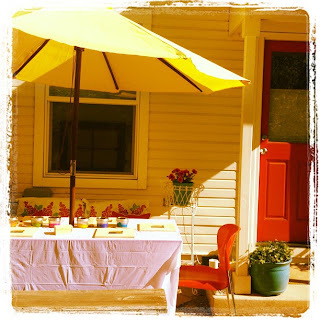 Young children approached tables laden with colorful art supplies begging to be transformed, and inevitably started their work by asking, “What am I supposed to do here?” It didn’t take long to discover that modern children require a well-defined program of support in order to reconnect with their innate ability to think in original ways. What’s the problem with logical thinking, conventional behavior, and good grades - outcomes that have long been heralded as the pinnacles of educational purpose, and the goal of mainstream schools? Unfortunately, the emphasis placed on the importance of ‘one right answer’ is often at odds with creative development and original thinking. American children are heartily rewarded for following the rules. At home, school, and in sports and social settings, a child who strives to do things right is a parent’s joy. Standardized tests have right answers, sports teams, community activities have well-defined norms and rules, and peer pressure is strong to have the ‘right’ clothes, hairstyles and friends. Mistakes are often undervalued. At Clementine Studio, I regularly witnessed the evidence -- young children dissolving in puddles of frustration because they weren’t able to make something ‘right’ on the first try. Engagement in the creative process requires confidence, tenacity, flexibility, and follow-through -- all processes that gain momentum when children are challenged by a mistake. This unique combination of factors (emphasis on correctness, and reluctance to make mistakes) helps create children who avoid taking creative risks. Of almost 38 million children enrolled in US elementary schools today, more than 66% of these children like to make art. Unfortunately, only 30% of children think they are good at it. This widespread insecurity leads children to abandon their creative aspirations. A perfect score on a test, a flawlessly executed piano piece, or a realistically drawn horse are valued markers of achievement at home and at school, causing young children to distance themselves from the uncertainty (and messiness) of creative, and original self-expression. The natural state of childhood is open, inquisitive, fearless, and creative. It isn’t until judgment, comparison, and the concept of correctness enter the conversation that children begin to shut down creatively, with often-irreparable damage done to any existing creative confidence and willingness to take risks. There is a name for that lucky creative type – the “Big C creative.” The “Big C creative” moniker is reserved for those extraordinary creative minds among us who have made a profound impact on life and culture; people like Picasso, The Wright Brothers, and Steve Jobs whose profound and far-reaching creative vision knocks our collective socks off. Alas, I’m not that person. I’m a creative wannabe. 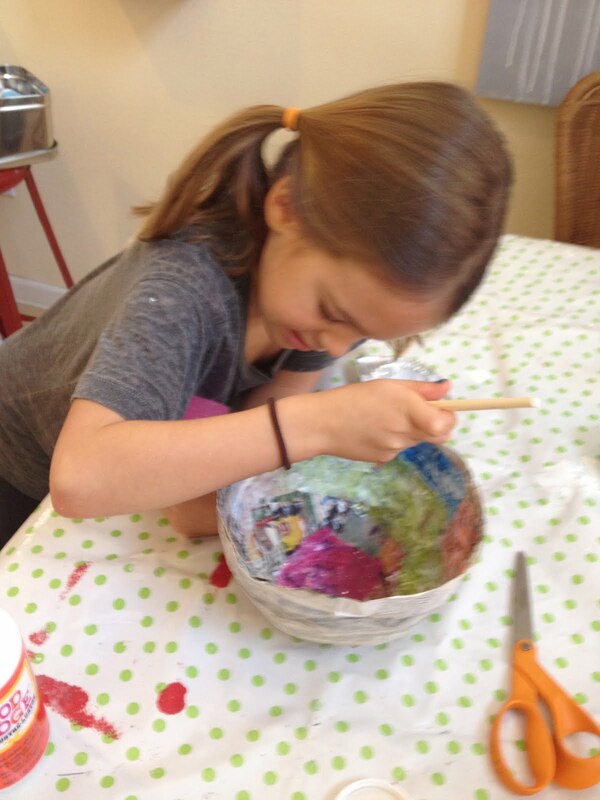 I’m drawn to observe the process of children’s art for many reasons, not least that it infuses me with a glimpse into the workings of the authentically open, fresh, and developing mind. Working with children as models for the creative process helps me to understand that I (indeed anyone) can pick up some of the seemingly effortless, creative dash of children. The “little c creative” type is more my style - the type of person who shows creative ability through problem-solving (stretching a very tight budget), innovation (making modeling dough from spinach when the chemicals in regular clay grossed me out) and self-expression (making up songs in the shower) – “Little c creative” potential is present and available in all of us. Over the years I have developed certain know-how on the subject of children’s creativity and why it is so staggeringly important. 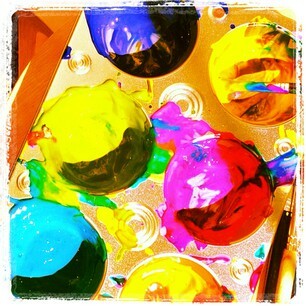 I preach from my Clementine Art bully pulpit every day: practice creativity or else! So why have I gotten so tangled up in my own creative process? Why are so many potentially creative souls tangled up in theirs? The answer has many parts, and applies to everyone who has declared herself lacking creative bones. Since children are developmentally limited to a worldview that puts the self on center stage, it’s not surprising that children know what they want, and will try many different approaches until they’ve discovered the most satisfying way to say it. 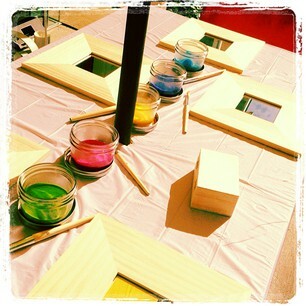 When is the last time you put your self in the spotlight with an invitation to express yourself creatively? The creative process takes courage. It takes guts to form a vision and see it through. Children haven’t yet developed the self-consciousness that comes from a critical eye. Their innocence starts with simple clear seeing, and goes from there. Their vision is then grounded in the fresh, unspoiled interpretation of what is in front of them, unhampered by fear of the outcome. 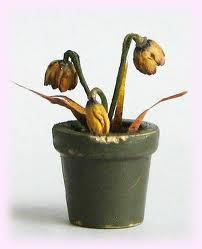 It takes resilience not to judge yourself a total disaster after you make your first mark. By watching children, I always learn something about the childlike state of mind that goes something like this; what I’ve done is good enough to tape on the refrigerator. I don’t even notice, or care that the picture of my dog looks exactly like my picture of my dad, with extra legs. It takes a visionary and a problem-solver to dream of sending a cardboard box rocket to the moon. Don’t you remember having ideas as a child that could have changed the world? As an 8 year old in the early 70’s, I waited impatiently in the car one morning while my mother stopped into the grocery store. I was itching to have a friend over, but couldn’t contact her.Wouldn’t it be great if there were phones in cars, I thought? When did we stop dreaming? Any more importantly, why? Just think what any of us could have come up with if given the encouragement and tools to form, develop, and follow-through on our biggest and best ideas. I believe every soul has the potential for creativity, and every human life can be made richer by engaging in the creative process. The creative spirit only needs to be approached with respect, and a sense of possibility. 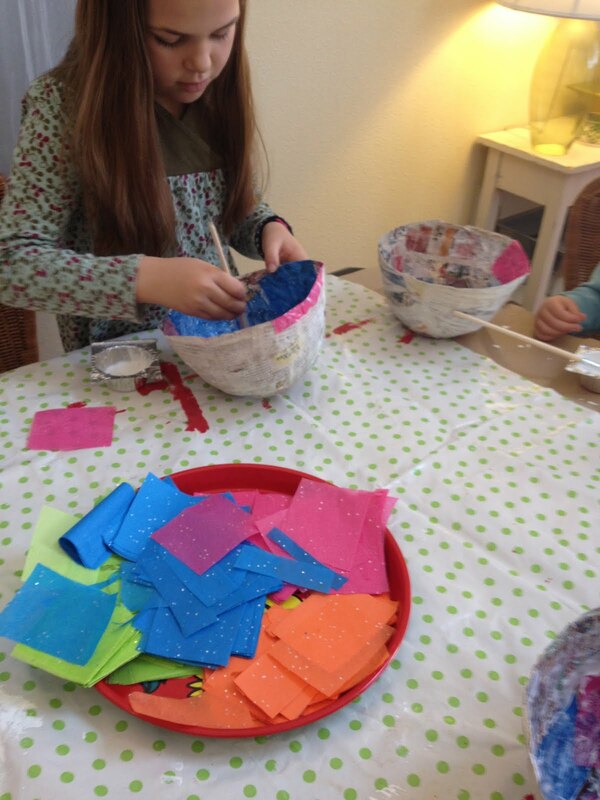 I've been delighting in and learning from children for almost 20 years as a teacher, and former owner of Clementine Studio: Art Space for Children. 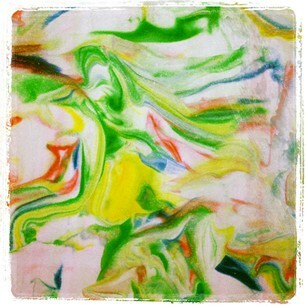 I love to watch a child's spirit emerge and develop through the process of art. 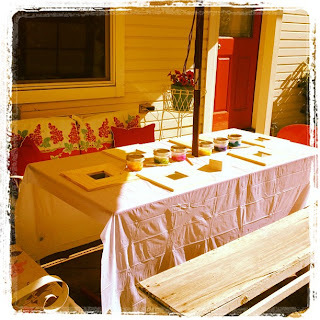 Clementine Art provides little hands with the natural, simple and lovely art products they need.